The story suggests that like other mainstream stars of the era, Khanna could be taken unawares by a working environment that wasn’t slapdash, where dialogues weren’t scribbled down on the sets an hour before the shooting began, and actors weren’t mollycoddled. But it also suggests that he had the discipline and humility to step out of his comfort zone. Little wonder then that this strikingly handsome man, who might have made a career out of being a poster boy, letting his sunglasses and open shirts do most of the work for him, participated in a number of relatively offbeat or understated films – starting with Gulzar’s Mere Apne and Achanak and Sunil Dutt’s Reshma aur Shera, and continuing for the next two decades, through Meera, Lekin… , Muzaffar Ali’s uncompleted Zooni, or Patil’s Rihaee (in which he played a man who returns to his village to find his wife pregnant by someone else). Yet Khanna’s abiding legacy will be his work in commercial cinema. (My first major memory of him was the buzz created in the mid-1980s by his impending return to films after a five-year stint with Osho – followed by the frisson-producing opening credit in Insaaf, which proclaimed “Re-Introducing Vinod Khanna”.) And the most intriguing thing about his mainstream career is the transition, over a few short years in the 1970s, from being a dashing young villain – devilishly good-looking and urbane in a way that other bad men of the time simply weren’t – to becoming a conservative, mostly straight-arrow hero. It’s quite a leap. To appreciate it, look at some of his early films. Watch the sneering, clean-shaven Khanna in the goofy 1971 Elaan, for instance, where he plays sophisticated henchman to Madan Puri and Shetty, derisive one-liners dripping from his thin, curved lips as he effortlessly steals scenes from the “hero” Vinod Mehra. Or a moustached, more bucolic Khanna as the dacoit Jabbar Singh (a proto-Gabbar), terrorizing a village in Mera Gaon Mera Desh. Watch Aan Milo Sajna or Purab aur Paschim for glimpses of a screen personality that was edgier, less predictable, therefore more unsettling than the regular villains of the time. This might not seem a kind thing to say – especially in an obituary – but keeping in mind Khanna’s undisputed status as a big star from the mid-70s onward, chunks of his career have a cipher-like quality; and not just because of the years when he was absent. No doubt he worked in many terrific films during his hero period – among them Qurbani, The Burning Train and the Amitabh films – and nothing about his performances can be faulted. He had a strong screen presence, could be very sympathetic when required, and he always looked great. But equally, very few of those films can be said to rise or fall on the strength of his contribution. He could come across as a little bland in some of them, and this quality was cleverly harnessed by Manmohan Desai (a man no one could accuse of blandness) in Amar Akbar Anthony. In their entertaining book about Desai’s film, William Elison, Christian Lee Novetzke and Andy Rotman make a few subtextual observations about Khanna’s Amar – the Hindu as eldest brother, the head of the multicultural family who is expected to be restrained and proper and humourless, while there are no such constraints on his siblings Anthony and Akbar. Even if you dismiss this as academic “over-analysis”, and even if you disregard his later roles as a benevolent paternalist and his political career with the BJP, one can note that Khanna’s mainstream career – after he “graduated” to being a leading man – has a certain primness to it. As a leading man, he was more vanilla than Bachchan’s heroes, not as uninhibited and energetic as the dancing stars like Jeetendra and Rishi Kapoor, and there weren’t as many flourishes of personality as Shatrughan Sinha. “Solid” and “personable” are the words that come to mind. This might be an unpopular opinion, but I prefer the actor’s earlier avatar, and feel that if he had stuck with it for a few more years, we might have seen a truly potent villain (or an anti-hero who was nastier and less sympathetic than Bachchan’s Vijay) instead of a generic, honourable hero. The steely glint in the eye, the withering putdown, the smirk that could make that handsome face look so cruel – vestiges of these qualities can be seen in even the good-guy roles. Watching these with knowledge of his early career, I sometimes fancy him as a Jekyll waiting impatiently for his inner Hyde to reemerge. 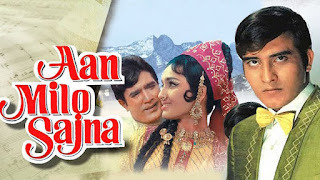 Consider something like the “O Saathi Re” sequence in Muqaddar ka Sikander, a film that gave Khanna one of his most thankless second-lead parts. In itself, this is a lovely scene built around a lovely song: Bachchan is performing soulfully, Raakhee is watching him all teary-eyed… and by her side there’s Khanna smiling at them both like an extra. The villainous VK of a few years earlier would have cracked a barbed whip, or walloped them over the head with a briefcase full of gold biscuits. And then sneered. And it would have been great. I started reading your blog when I was a wee lass in school - and now I have just begun my Doctorate. I want to tell you how much I admire your writing and that it was one of the few places which impressed on me how research could be about everything and anything and language can elevate potboilers you didn't want to watch on Zee Cinema. When I was pursuing my Bachelors, I wrote a term paper on the 'vamps' in Hindi Cinema and for a glorious moment I felt I almost tended to --Jabberwock. I have since moved from Literature to Political Science but I shall always remember that term paper as my ability to shock my professors from Lady Shri Ram with all the thinly veiled innuendo. Please keep writing. I am a HUGE fan and admirer. Thanks so much for the comment - very nice of you to say such things. Do mail me the vamps paper if you feel like. Sounds very interesting. The year was 2006 I think. One of the first posts I remember reading was the one on the righteous indigestion of traveling Indians. Another was on Naipaul where Jai dismissed him as an old curmudgeon. There was another one on Sudhir Kakar and Indians. I also remembered him mentioning Hitchcock a lot. Now I had little idea about Hitchcock back in 2006. I thought of him as a TV artist. I remembered his silhouette from some old magazines. Never knew he made movies! But Jai mentioned him so often that I got curious. And downloaded a Hitchcock movie from my campus's movie server (maintained illegally by IIM Kozhikode's IT cell). The movie was "Dial M for Murder". My love affair with movies started. 10 years and some 600-700 movies later, I remain indebted to this blog for having introduced me to movies. Sure I have had differences (largely political and cultural). Voiced and debated vociferously in numerous blogs. But I must say that I wouldn't have gotten started on movie watching but for this blog. Another memory from those days was this guy called "Falstaff" who used to comment on this blog. I used to rate him very highly and thought of him as very clever. He disappeared suddenly from around the time I started commenting here! thanks for this comment, Shrikanth. And good grief, I had no idea that I was the one who led you down this road of iniquity and time-wasting. Somehow I always thought of you as even more of an Old Hollywood-geek than I was, and for as many decades. Anyway, thanks very much for your participation here over all these years. Many of those conversations - even when I disagree about things to the point of eye-rolling or banging-head-on-table - have been more stimulating than the safe, "we're completely on the same page" conversations I have had with left-libs. Since many are sharing their personal stories with the blog, let me come out of my shell and share mine. Have been following it for some 4 years now. Have mostly been a silent reader and left a stray comment here and there. At the risk of sounding a little cheesy, I must say that your blog quite changed the way I watch films and also inspired me to write a few blog entries where I have tried to document my thoughts on some films I found interesting and stimulating in one or more aspects. Miss the long comment trails though, some were quite interesting as the pieces themselves.. I haven't watched a lot of his films. One of his roles that sticks in my mind is his "Sher Khan" in the Period film "Prem Kahani" starring Rajesh Khanna. Very energetic performance. I never quite thought of him as a major figure in Indian cinema. Not sure why. Yes, mentioned Sher Khan in the post (which you clearly didn't read). I did read large chunks of it, but missed that line. I don't remember the role he played in Purab aur Paschim. Guess it is a small role. I adore VK and his two boys. So to me, his loss feels almost personal. But, I have to make an admission quite unrelated to VK: I am growing increasingly weary of thie ongoing Bachchan love that seems to have gripped the audience and Bwood alike for the past 4 decades or so. I get it: he is a terrific performer who can do slapstick and somber with great ease. But, he was one of many fine star actors that period produced, and a lot of his fame and continued relevance can be attributed to, I think, plain, dumb luck and happenstance, as is always the case in these situatios. But for some reason, more than a mere handful of people seem to think he must be unmatched and brilliant simply because he got the highest and most enduring stardom. It is akin to assuming that just because someone is from Harvard, they will always be the sharpest person in any gathering of people. That simply isn't true. I bring this up because this Bachchan worship is starting to really interfere with m y viewing of his past and present performances. But coming back to VK, I don't know. He was one of those stars I took a shine to almost immediately like Sanejev K, Shashi, Shammi K, Dharamendra, and yes, Bachchan. But like I said, to me they are equals in their talents but possibly unequal in how lucky they got. 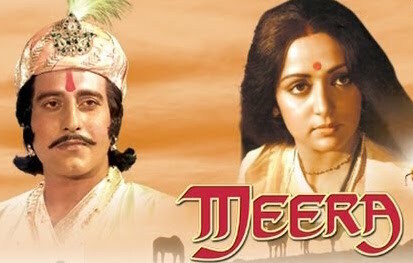 Ps: I was a bit irked at your dismissal of Vinod Mehra, another star of that period that I loved, but I can live with that. I mean, he can seem an ac quired taste to some. Considering the niche but devoted group of fans one of his sons have, I think Akshaye might end up being like the next Vinod Mehra: talented, handsome, sproadic worker, ut much beloved of a slim but steady band of followers, including myself. In fact, I adore both his sons. When did I last see a reclusive star from Bwood who just disappears between releases? I say, not in the recent past, which makes Akshaye quite priceless to me :-) So, yeah, in case there was any doubt about my feelings, I love VK and his two boys! Plain dumb luck, of course, has a lot to do with almost anyone's success - that goes without saying. Also, much the same way that your comment is a reaction to the Bachchan-love you seem to see everywhere - MY comments are partly a reaction to a lot of things I grew up hearing, and still hear from many people: such as 1) Vinod Khanna had more fans than Amitabh and was just about to take over the number-one spot, but then he gave it all up for spirituality, 2) Bachchan was just a star, while Sanjeev Kumar was a Real Actor. I don't agree with those assessments at all. "it's also possible to genuinely feel (as I do) that Bachchan was a good cut above everyone else as an all-round performer." I am inclined to agree with that. Bachchan covered a very wide range. Watched a very early film of his yesterday - Sanjog. Very atypical. Plays a clerk who gets to work under his long lost wife Mala Sinha. He is perhaps the only good thing about an otherwise spotty film. "he didn't like the term "actress" because, to her mind, her being a woman had no bearing on her performances"
Sure. I guess the day is not far off where any form of identity becomes anathema to the left. Maybe we should stop giving kids names which carry so much cultural baggage. And maims them for life. Why name kids Ram, Krishna, Christopher, Matthew, Abdul.....so much theological baggage there. We should just call people A, B, C, D, XYZ etc. Names with no cultural baggage. No gender connotations. No religious association. Very secular. Free from culture. Free from values. Actually, if this were to happen, I'm sure some sort of cultural or other baggage would quickly accrue to "A", "B", "C" etc. Humans are like that. Identity politics - and the many prejudices and intolerances that accompany them - are very much hardwired into us. I remember a friend telling me that in Bachchan producers found someone who could do comedy, melodrama, action, romance and they stopped giving work to actors like Asrani etc thinking Bachchan can bring comic relief to audience. They were willing to pay a very high price to Bachchan because they saved money they would have spent on Asrani and others. I found this a good economic way to explain Bachchan phenomenon. Sorry to disappoint you, Anonymous. (Don't know what "khanapoorti" means, btw.) But surely it's okay to disagree about VK. In my view, the only co-star Bachchan was never able to overshadow was Dharmendra - but even that comes with the caveat that they weren't the same generation, and it's just about possible that AB was a little deferential towards someone much senior, who had also helped him early in his career. Among co-stars of the same vintage, I would place Shatrughan Sinha very marginally above VK as a Bachchan rival. Though again this is partly because SS had such a distinct (and such a whimsical) screen persona. P.S. I like Vinod Mehra too, btw. And Khanna. and Shashi Kapoor. And many others. I even liked Sanjeev Kumar (whom I otherwise enjoy mocking so much) in quite a few films. Oh I am sorry, I didn't know that you were such a BIG fan of Amitabh Bachchan. My mistake, I should have realised what I found so disheartening about this obituary, eulogizing the Big B at the expense of VK. On my part, I find that Bachchan more often than not had an author-backed role and yet many were able to out-shine him [And it is not only Dharmendra, who incidentally made Bachchan totally (to borrow a term that you have used) 'bland' in an episode of KBC ] is a comment on their acting prowess. Anyway, as you said, we can disagree about VK (and others also for that matter). Excuse me, but my English is not good so the closest I can explain 'Khanapurti' is when you do something only because you have to do that particular thing without your heart really being in it. Okay, thanks. ANY professional writer has to do that sort of writing at some point or the other - and I did put the caveat right at the top, about the necessary reductiveness of any obituary written on a short deadline. That said, I did also make an honest attempt to examine the legacy of an actor in whom my personal interest diminished somewhat after my childhood years. If the piece reads a bit indifferently or slapdash, that could also be because of my own current life circumstances, which I have mentioned both here and elsewhere in other posts. Writing long, indepth things is not a luxury I have at the current time, and frankly the obituaries I should be writing are the ones for the people I have been looking after. Unfortunately no one will pay me for that. Just wanted to add one thing, since you mentioned being disheartened by how this piece eulogized AB at VK's expense: would you have preferred me to write an insincere piece that placed VK on the same plane as AB, even though that wouldn't have reflected my actual feelings? Now THAT would have been a mechanical, factory-generated obit. With the many tributes going around across publications, surely it's good if a couple of them are written by people who weren't besotted by VK as a goody-goody leading man, and therefore had a different perspective to offer. First of all my apologies. I did not know that you are going through some rough times. There was a time when I read each and every post of yours but for a year now that luxury has been denied to me and I can only occasionally read the blogs that I like. That has also made me aware why I was so disappointed with this piece. I remember reading your posts and feeling "Wow! This is real interesting." (Who can ever forget your posts on Ekta Kapoor's Mahabharata?) And I am sorry that the stress is really getting to you otherwise you would not have written this-totally-uncalled-for remark:"... frankly the obituaries I should be writing are the ones for the people I have been looking after. Unfortunately no one will pay me for that." God forbid That one day we be selling the obituaries of our loved ones! I never said that I had a problem with you not liking VK. We all have our likes and dislikes. It is just that I thought that the post instead of focussing on VK, once again became a medium for singing praises of AB and like Sev Snape, I am dead tired of this constant worshipping of him. But that's neither here nor there. You have better things to do than get into this discussion and I am thankful that you took the time to reply to my comment. Here's hoping your loved ones recover soon. All I can say to this is that it comes across as extraordinarily judgemental. And it's the sort of judgementalism that seems to come from very little firsthand experience of truly difficult situations and the many ways in which those situations can affect people. "And it's the sort of judgementalism that seems to come from very little firsthand experience of truly difficult situations and the many ways in which those situations can affect people." Well, Jai Arjun Saab, if you want to make assumptions about me based on a couple of comments that I have left on a post, all I can repeat is that the stress is really getting to you. Oh, hilarious. Accusations of “assumption-making” coming from someone who started this conversation with that “khanapoorti” remark, then made that smug and judgemental (no other words for it) comment about my “uncalled-for” statement. Again, based purely on your existing comments: if you were to experience one-fifth of what I have experienced in the past year, your reactions would be far, far stronger than anything I have written here. Maybe you’ll come close to understanding some day. For now, carry on feeling superior while hiding behind your anonymous handle.